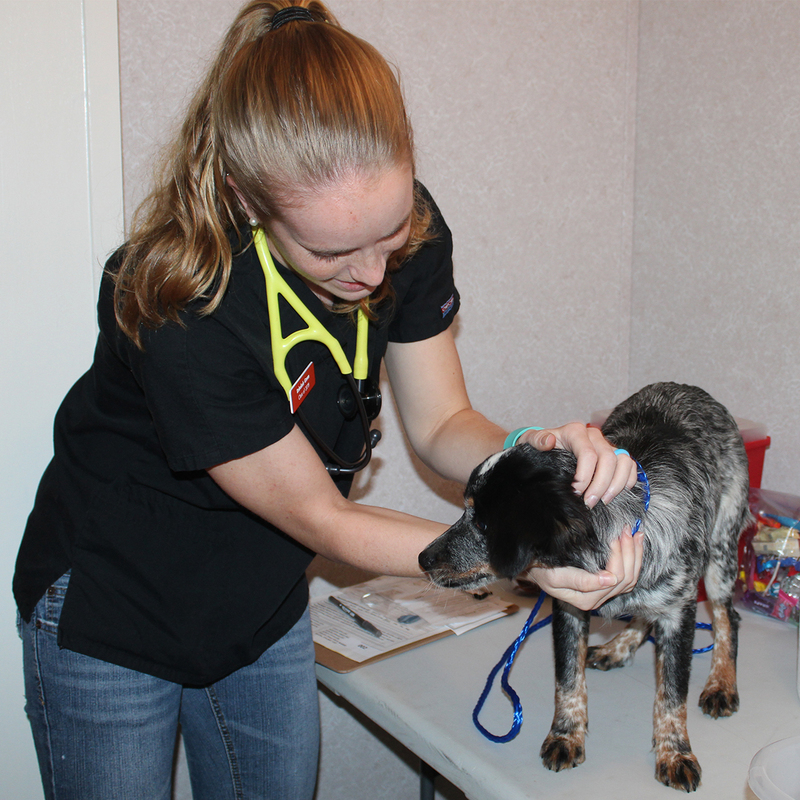 Third-year veterinary student Rebekah Green works during one of the community outreach veterinary clinics in north Alabama. Veterinary medicine students often find themselves immersed in learning environments in the classroom or laboratory, intensely studying their coursework. Throughout the months of October and November, however, Auburn veterinary students who are enrolled in a special outreach elective course, are participating in a community service program in north Alabama, providing veterinary services to underserved areas. This year, seven third-year and one second-year student are stepping outside of the classroom and learning by serving the community through the elective course, “Veterinary Service Learning and Outreach.” The course, made possible by a grant funded through the Auburn University Outreach program, allows students to travel to under-served communities and partner with local veterinarians to provide free veterinary services and education to pet owners. This year’s class of eight students is working in clinics being conducted in Centre and in Guntersville, Ala., where the class partnered with Dr. Jeremy Deaton to offer no-cost veterinary clinics. The students are providing wellness exams, vaccines, spay and neuter certificates, heartworm testing, nail trims and other basic pet care. The service is available to anyone who lives within a 40-50-mile radius around Centre or Guntersville. The clinic was made possible by Dr. Deaton’s partnership with the college and his veterinary service in Centre. Dr. Deaton is the managing veterinarian at Nichols Animal Hospital and the owner of Deaton Veterinary Services, a mobile veterinary service for both companion animals and livestock. The course is now in its third year at the AU College of Veterinary Medicine. In addition to the clinic being conducted in Centre, the class plans another program in Kentucky during the university’s Christmas break.